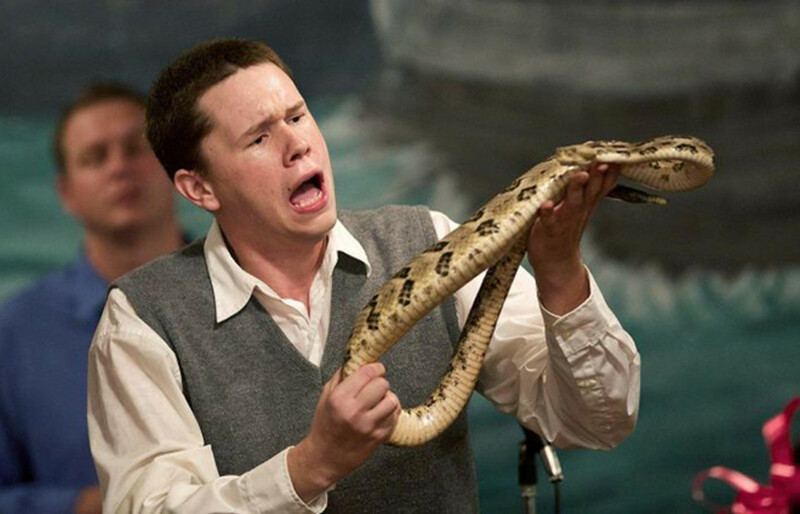 American religious nutjobs handling their snakes in church. All part of downgrading the other guys' beliefs in preparation for instilling your own. Christianity did the same thing as it spread throughout Europe. Pagans were devil-worshipers and witches; their deities were transformed into evil horned things. But since they (the Xtians) couldn't kill everyone, they incorporated many pagan ceremonies and celebrations into their own in order to convert them. Exactly... you got it instantly. Too many people simply don't. I am having a wonderful evening... I sold three paintings this afternoon! Hurray. We just had a tornado blow past us so maybe I need to be scattering some tobacco, sunflower seeds, beer, weed, and anything else. Good grief, you guys okay?? That's awesome! I didn't know you are an artist! What media do you use, what's your subject matter? Were you at a gallery or art show? Can you post a pic of one of your works? We are and my family is all checked in ok. Haven't heard much in terms of damage reports yet. Some ripped off roofs and anecdotal stuff. News here is slow in weekends, plus still raining. Our tornados are not particularly bad when they do come comparatively speaking. Just rain-wrapped intense fast moving storm cells more than cars and cows flying. Topography helps mitigate tornado intensity in my area--they either have to smack into hillsides or rise over them which helps break them apart fairly quick. That's good. Yikes. We've had gale force winds now since shortly after midnight Friday. The snow began this morning so we've had 13+ hours now of heavy snow, gales, and non-stop NOISE. Impressive drifts out there! Not expected to end till either tomorrow night or maybe July. Are you over in that east coast area getting smacked with severe weather? In mythology, the serpent symbolises fertility and procreation, wisdom, death, and resurrection (due to the shedding of its skin, which is not akin to rebirth), and in the earliest schools of mysticism, the symbol of ‘The Word’ was the serpent. The ‘light’ that appeared was metaphorically defined as a serpent called ‘Kundalini’, coiled at the base of the spine to remain dormant in an unawakened person. Divinity or awakening one’s Godhood and latent abilities came with the rituals and teachings brought by the serpent people. To understand them, we must look at the original ‘serpents’. In China, it was a male and female pair with human heads and serpent bodies named Fu Xi and Nu Wa who created humans. In Sumer, it was the Annunaki Nin-Khursag and her husband Enki who were given the task of creating workers. Enki is known to us as the serpent in Genesis—the one who gave us the ability to think and reason and so was cursed by his brother Enlil for it. To the Hindus, it was the cosmic serpent Ananta who created us. So, if, at the dawn of man’s creation we have a pair of serpent-like beings who created us, then those of the serpent cult must have been their direct descendants, either by blood or by spirit. The next serpent was Enki’s son Ningizzidda, known to the Sumerians, Egyptians and Tibetans. According to Zecharia Sitchin, he dwelt in Magan, or what is known to us as Egypt, leading theorists to believe he was Thoth who formed a mystery school propagating ideas of self-improvement and enlightenment, furthering his father’s deeds and philosophy. If Enki and Ningizzidda ruled over Magan as is claimed, then that school would have been a beacon attracting all who wished to gain knowledge, backed by the power and might of Magan. It was claimed at the Council of Nicea that ‘the powers of gods came from Egypt’. There was a Great White Brotherhood (named for their raiment), a prominent mystery school in Karnak. A branch of it became the Egyptian Therapeutate who in Judea were known as the Essenes. Jesus, being an Essene, most likely was initiated in Egypt at this mystery school, rising up the levels until he became a ‘Master’. Yes. So far sounds like a lot of damage, mostly from fallen trees and limbs but no reports of serious injury or deaths in our area. A few houses reported destroyed by large trees coming through them. Went out last night for a quick store run. One end of my neighborhood was blocked by down lines, and the police had cars sitting in road ways with lights on and the spotlights lighting up some areas where there was street flooding to warn people to slow down before they hit the great lakes that had formed in the low spots. The temps on the backside of the front were 20 degrees below what they were before it hit us which explains a lot of the turbulence in the atmosphere. That's way too close. Stay safe down there. Thanks, but isn't like there is anything you can do about it. Storms happen. These storms are the reason I had every tree that could possibly fall on my house either topped or removed before I even moved in. My neighbors who just moved here from another state were freaking out once their cell phones went into emergency alert mode with a tornado. Told them there was no need to worry because the ridge lines push tornadoes off to the west of us and sure enough that is what happened. Saved by geography, how cool is that? Thankfully twisters aren't a thing much up here in the Frozen North. We sure had plenty of them when we lived in STL though. I work in Acrylics and Ink.. I paint light houses, sea scapes, elephants, cottages, jazz muscians and naked women. I am still not sure my work is good. It was a show... We will be having another at the YMCA here to raise money for kid's lunches. I painted as a student and hadn't done anything in decades.. I consider myself an amateur. It is comforting since that is the prevailing weather pattern. When a storm comes in from the east or north I freak out because those only happen when it is particularly violent and nasty and because there is no ridge line to protect us from them LOL. Usually only happens when hurricanes or their remnants are pushing inland from a Mid Atlantic landfall. Love learning about this stuff. I still haven't picked my minor yet; was leaning towards biology since I have a slew of credits already in that discipline. But more and more anthropology is beckoning. One of my favorite classes was anthropology which was taught by a world wide famous instructor. He retired shortly after that semester was completed so I count myself lucky I was able to experience his story telling of his adventures. Signs of a Cult. Is Fox News a Mainstream Cult?